Artists and athletes arrive in ‘flow states’ via immersion in the present moment. It is an immediate occurrence where preparation meets a willful surrender to everything in the now. The combination of a singular focus and a relaxed, centered presence is a merging of action and awareness nourished through years of immersion in the creative zone. It has been a long time since I that had my rendezvous with Steve Roach. Even if the shaman synthesist from Arizona multiplies the works which have all some similar structures, it remains in each of them a unique musical soul which differentiates Steve Roach from the other makers of ambient structures. The second opus of a trilogy to be ended which began by Soul Tones in the winter of 2012; Future Flows drags us into an experimental sound universe where Steve Roach manipulates the sounds by sculpturing them as a cabinet maker works the wood. The purpose aimed by Roach is to insufflate his music a spectral aura which will float in our ears as the ghosts of the desert nomads are enriching its legends. And his breaths of synth are always so warm. So welcoming, like friendly breezes which call us back to our inner feelings. On “An Omnipresent Sense Prevails”, they caress our ears with spectral harmonies that we perceive in the translucent whispers which float with a shaded lightness. There are linear movements and others more swaying in some synth layers which float of their long musical wings, swirling lazily above our perceptions. Making it, two sound entities are in confrontation; a calm one which blows like blinkered winds on a horizon darkened by its spectres and the other one more musical which floats such as seraphic rustles. But the one as in the other one, we are in the den of the Immersion series but with more incandescence. In fact, forget this and let’s rather talk about Structures from Silence, because “Spectrum of Changes” is a harbor of serenity with its pile of synth strata, as soft as musical, which float between two ears which cannot refrain from making a link with this monument of chloroformed atmospheres that is Structures from Silence. Surfing on the harmonious vestiges of “Spectrum of Change”, “Air Meditation” lands in our ears in a symphony of tight weaved spectral breaths which hum some air and float on breaths which became iridescent. The first crackling of an appearance of rhythm breaks out with an astral sweetness on the introduction of “The Texture of Remembering”. The shape is of electronic chirpings which sparkle in loops on the waves of a synth always very introspective. This marriage of harmonies and atmospheres to the paradoxes of the serenity brings some fine eruptions in the background which thunder dully throughout this concerto for snuffly locusts. And winds take back a little more vigour, concealing the singings of love from the electronic tiny creatures and concluding the 1st part of Future Flows. As much soothing as “Spectrum of Changes”, “Rapt in Night” stays the up at our sleep with the correctness of the god Morpheus while that, more aggressive, “Heart of Light” tears up the silence of its luminous oblong strata which float with so much acuteness as heaviness. 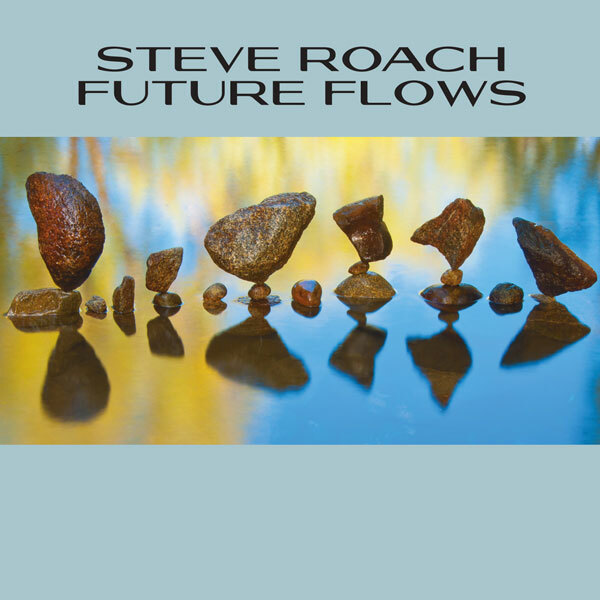 “The Future Flows from Here” demonstrates all of Steve Roach’s magnificence to sculpture melodious shadows from the nothingness. There is a strange organic life which sparkles and pounds behind these morphic synth layers which waltz with space, embracing our dreams and making them float in vapors of ether. Some will recognize The Magnificent Void‘s airs while I hear the ghosts of Back to Life to roam in this wonderful anesthetic duel which quietly derives towards the serenity of souls regretted, to sacrifice itself in the hearth of very morphic and quiet “Regeneration Revelation”. Future Flows is the second part in a triptych that kicked-off with Soul Tones at the end of 2012. If you´re looking for any significant change in sound or direction, Roach´s Future Flows won’t bring any of that. Still, the surge into deep and immersive sound worlds continues and seems what this recording is all about. From the first track on, the long form soundscapes (according Steve’s site they were all created from a palette of hand-crafted timbres and techniques) spread a nice tension through the ebbs and flows going on in the various layered, non-rhythmic textures. The outcome offers various symphonic/ethereal flavors, revisiting sonic territory investigated on e.g. Back to Life and the massive Mystic Chords and Sacred Spaces, but also the extensive journey undertaken on the older album Ascension of Shadows with kindred spirit vidnaObmana. This slow-flow mood and at times even meditative music has a nice touch and soft glow, creating an overall contemplative sonic aura for 70 minutes. This CD from 2013 features 71 minutes of soothing electronic ambience. While designated as a series of shorter pieces, the music here flows into one grandiose flow. Harmonic streams dominate this tuneage. Vaporous airs are established, softly roiling through the sky, and they continue, seemingly forever. In truth, the texturals gradually undergo changes, altering their resonance with extra-patient velocity. The tones ooze into each other, sneakily manifesting differences that are often too subtle to overtly notice. Secondary flows tend to help obfuscate this evolution, blurring the edges of each harmonic drone and fusing everything together into a shimmering sonic environment. Once immersed in this zone, the listener becomes more attuned to the subtle fluctuations going on in the music. A sonic sensitivity is fostered in which one merges with the auralscape, finally becoming acutely aware of each successive change undergone by the flow. One notices how a steady drone blossoms into a twinkling of soft diodes, while auxiliary tones slide into position to embellish the pacific structure. Each changes, previously occurring beyond your concentration, is revealed in all their gentle glories. No percussion is present. Indeed, rhythms of any kind are totally absent from this music…unless you count the elongated ebb of sighing electronic textures as some kind of drastically slowed-down beat. L’instancabile maestro dell’ambient music Steve Roach torna con cadenza annuale a rifornire della propria musica il catalogo Projekt. Fissatosi ormai da un paio d’anni a questa parte sulla cifra dei due album solisti all’anno – generalmente uno per l’etichetta di Sam Rosenthal e uno per la sua Timeroom – collaborazioni e live esclusi, il musicista californiano pare aver fatto coincidere una netta riduzione di prolificità a un aumento deciso della qualità media dei suoi lavori, tanto che i più recenti possono annoverarsi quasi tutti tra i più riusciti della sua carriera. Dopo i due gioielli con cui aveva segnato l’inizio di questo 2013 – l’ipnotica collaborazione con il fido Byron Metcalf per Tales From The Ultra Tribe e l’ermetico e notturno “Soul Tones” – Roach sigla in questo nuovo Future Flows una sorta di collage di gran parte delle sue esperienze più incontaminate, in un’operazione che ricorda molto da vicino quanto fatto nel 2007 con “Arc Of Passion”. Ci sono l’ormai immancabile purezza cosmica di The Magnificent Void, il melodismo camaleontico, i droni scorrevoli, le sequenze analogiche di “Sigh Of Ages” e i climi plumbei di dello stesso Soul Tones. Il risultato è un album che finisce per autocitarsi più del solito, senza per questo far mancare l’ormai usuale, elevatissima qualità. Il sogno cosmico dell’iniziale “An Omnipresent Sense Prevails” e l’oscuro affresco spaziale di “Rapt In Night” non fanno dunque mancare più d’un inchino ai conterranei Michael Stearns e Michael Amerlan, segnando l’ennesima intersezione fra loro fondamentali linguaggi sonori. L’atarassia sovrana in “Spectrum Of Change” e il candore livido di “Heart Of Light” toccano invece territori di stampo più squisitamente drone, pronti ad assumere connotati più colorati fra i richiami sussurrati di “Air Meditation” e le sentinelle in coro della conclusiva “Regeneration Revelation”. A completare il quadro i due lunghi tappeti di saliscendi analogici di “The Texture Of Remembering” e, soprattutto, “The Future Flows From Here”, che cercano con nostalgia i tempi del mai abbastanza considerato World’s Edge. The journey reveals very silently with “An Omnipresent Sense Prevails”, an 11-minute composition, but it takes only about minute and the free-floating drift spirals toweringly into grandiosely expansive panoramas, gracefully gliding and undulating with magmatic immenseness. These amorphously embracing and essentially contemplative soundwalls are holding an undeniable signature of the master. “Spectrum Of Change” safely dwells in the terrains of sheer atmospheric beauty, slightly less denser and more minimal on the first exploration, although multi-dimensional billows continuously emanate and then fade out into vaporously permeating stillness. “Air Meditation” paints infectiously mesmerizing circles guarded above by voice-like drone blankets. Rather shorter piece, but hauntingly mindscaping and precisely interacting with its title. “The Texture Of Remembering”, which gets over 11 minutes, enters straightly into more aerial realms, warmly meandering through profoundly stimulating elevations and meticulously coalesced with assortment of cybernetic sparkles. What a journey!!! Make sure you have your headphones with you, immersion extraordinaire awaits here!!! “Rapt In Night” immediately dives into abyssal drone heaven, quite short, but utterly monolithic and expansive. This track masterfully captures all the essence of the nocturnal serenity!!! “Heart Of Light”, another brief piece, keeps on the path of warmly traversing and deeply evocative sceneries, which are this time merged with piercing swirls. Magnificently immense!!! 17-minute epic “The Future Flows From Here” briskly spreads with floating, ebbing and twisting massive and intense layers of washes, while gently shimmering sequences excel on distant back. The transition in the middle of the track is absolutely embracing and shifts the whole composition into pure atmospheric splendor. A truly jaw-dropping!!! Certainly a creme de la creme of the whole album and another magnum opus since Hall of Fame compositions such as “Where Rasa Lives” or “Today”. Bravo, Maestro!!! “Regeneration Revelation” closes this wonderful, 71 minutes long ride with ultra colossal dronescape, enriched with various, well-concealed rewards and cruising with intensely absorbing amorphousness and eternal grace that can only be Steve Roach. Wow, absolutely thrilling!! !